Ashland, VA, D.C., and North Carolina. Album release parties as we go. Please join us. Aw right! Live is HERE! Get it NOW! After a lifetime of music, travel, and food, over a million miles on the road, over 180,000 bowls of gumbo served for free, thousands of gigs, tons of hot sauce, over a hundred original songs on thirteen albums, scores of free concerts at homeless shelters and soup kitchens, after all this . . . it’s time for a live album. 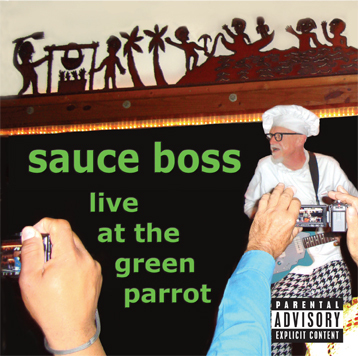 Recorded in November 2011 in Key West, Florida, “Live at the Green Parrot” is definitive Sauce Boss. It’s edgy, slide guitar, rockin blues grooves, with a large serving of fun in the Sauce Boss tradition. These songs come straight out of the life of a true character, adventurer, raconteur, and poet. Come and get it. PLEASE, PLEASE, PLEASE: call your favorite Blues DJ and request a cut from “Live at the Green Parrot”. Time’s a wasting’! Betcha ya they have a copy already. We just sent out over 600 CDs to radio stations all over the US and in Europe and South America. THE GOOG IS OUT TO GETCHA!!!!!!!!!!!!!!!!!! That’s right, Brother. That’s right, Sister. Google knows what yer thinkin at this very moment. Just the fact that you’re reading this message could very well lead to a monstrous inconvenience. When the “powers that be” find out that you ….well…I’m just sayin…just because I’m paranoid…What I mean is…When the Goog finds out what you are doing, yer liable to end up in hot water. What are you doing, and why are you here? You ride three or four hundred miles on two wheels, ya get hongry for some real food that will hang with ya for a good long while. Lucky me, I just happened to be passin through Opelousas round about dinner time and so I stopped for fuel for me and machine. For the real deal Acadian cuisine, this is the place. I tried the Catfish Gerald – grilled catfish covered in etoufee. Lunch specials are from around six to nine dollars. There’s plenty to choose from on the menu. Steak, all manner of seafood, po-boys, burgers, salads, and the typical Cajun Creole bill of fare. Etoufee on top of a ribeye will keep you going all afternoon, and into the evening. Hey Laba’! Machine thirsty, stomach growling. Had to take a break from the road on a 700 mile ride. Recharge with some authentic Cajun cookin. SWEEEET! You are currently browsing the Sauce Boss Blog blog archives for April, 2012.